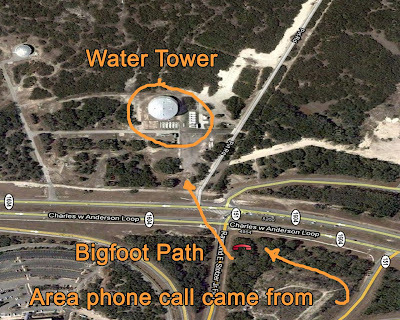 Bigfoot News | Bigfoot Lunch Club: 911 audio and full transcript of San Antonio Bigfoot call. 911 audio and full transcript of San Antonio Bigfoot call. I recommend that you play the video and just scroll down to read the transcript. There is nothing visually significant in the clip. At the bottom of this post is a photo of the traffic light and water tower mentioned in the call. 911 Dispatch: 911 San Antonio Do you need Police Fire or EMF. Caller: I'm not real sure mam, Um I just watched the biggest creat-critter, but it smelled real bad. I'm a homeless female I live right in the middle of the woods around 151 and Calebra. Just north where the light is? This thing was 75 ft away from me, smelled awful, devoured a deer carcass and then took off and like screamed, screached; and took off across the street. And I know you guys are going to think I'm crazy, but I'm dead serious,there was something very big. Bigger--a lot bigger than me (heh) -- out here. So we thought it was something you should know, really dont know what you can do about it. 911 Dispatch: Uhh, how long ago did this happen? 911 Dispatch: Ok, again, now tell now tell me where was it? This was is at 151 and Calebra? Caller: Ok yeah like, you know the light right at 151 just up from calebra on 1604 like where 1604 splits and you can get off on the access road to calebra or tyou can take 151? Caller: That light right in there? Its, yes, right in there It is a very large scary animal of some kind! 911 Dispatcher: Now was it standing on two or four? 911 Dispatcher: You live in a tent? 911 Dispatcher: Okay is there any way we can have an officer contact you? 911 Dispatcher: Now the deer was walking around and...? Caller: No. The deer was dead and it got devoured, it was a carcass. 911 Dispatcher: Okay and did you see signs of um a dead deer? Blood or whatever? Caller: Um actually Mam uh I'm not-I'm not going to check it out right at this moment. Is that ok? 911 Dispatcher: Are you with someone there? 911 Dispatcher: Did they see it too? 911 Dispatcher: How about I have an officer contact you guys out there? Caller's male partner: Like Hell! Caller: heh huh, we're not leaving where we're at, is like what we're trying to say. I'm a little bit scared and its raining. And um, I just want somebody to maybe check it out in the morning when its not dark. 911 Dispatcher: What i can do right now is have the officer patrol the area. Which direction did it run? Caller: It ran across um the light at 151, like towards the water tower on two feet. Like my husband said. Something very weird. I just wanted make a documentation to animal control. 911 Dispatcher: Have you ever seen or heard anything like this before? Caller's Husband: I lived in the woods for 6 yrs. I'm gonna tell you right now, I lived in the woods for 6 yrs, i swear to god I aint never seen anything like this! the sonuvabitch was bigger than me! Caller: And it had a very odd smell. Caller's Husband: I'm 6'3", I'm 6'3". it was bigger than ME! 911 Dispatcher: Its bigger than 6'3"? Caller: Yeah its bigger than 6 foot 3, its very large! Caller's Husband: (muffled) He carried the carcass off! 911 Dispatcher: What did he say? Caller: "He carried the carcass off!" 911 Dispatcher: Oh he carried it! Caller: I'm thinkin', I'm not going to tell him what I think it is. 911 Dispatcher: What does he think it is? Caller: (to her husband) What do you think it is? Caller's Husband: What I think it was? I don't know. I would be a liar if I said I thought I knew what it was. But I know it picked up that deer and run--on two feet! Caller: Yeah, its very large something. It smells bad and it's bigger than we are. 911 Dispatcher: So you saw it walk or runninin' or walk in which direction? Caller: Uh, towards the light at 151 and 1604. Caller's Husband: It went towards the water tower area. Caller: Yeah, it went towards the water tower area and it screached/howled. (to husband) Yelled? Caller: Yeah my husband's very large. Nothing has ever scared him. Ever. And um. Caller's Husband: I saw it too! Caller: I mean we both saw it, so. 911 Dispatcher: Did it have any type of clothing? Caller: No No, It was fur. Caller's Husband: (to caller) It had two feet momma! 911 Dispatcher: Okay and did you? What is your name? Caller: Jennifer, Jennifer. yeah its raining now and we can't hear nuthin' outside. Its kinda scary. 911 Dispatcher: Okay alright we'll have an officer patrol that area and see what we can find. Caller: I know, I mean you guys might find--or animal control might be able to find some tracks or something in the morning. Its hard to find tracks (innaudible, then to husband) She says she's going to send a patrol to the area. So. Caller's Husband: Go to the light and sound your sirens. Caller: Go to the light and sound your sirens, and we'll come oput of the woods and talk to you. 911 Dispatcher: you guys, you guys have you camp set up at 151 and Calebra? Caller: Um not exactly, um yeah in the area. Just go to the light and sound the sirens and we would hear you (from) where we're at. 911 Dispatcher: At 151 and 1604. Right? Click on picture to see full-screen view. 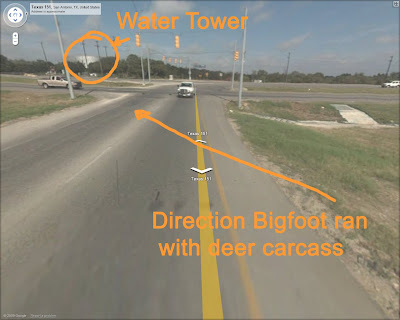 In this picture is the intersection traffic light and the water tower mentioned in the call. Rick Dyer, BigfootTracker.com, shot a male bigfoot on September 6th, 2012 in that exact area. They have the body and it is to be release in April 2013 to the public.